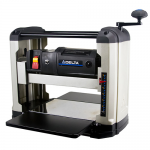 Benchtop thickness planers are an essential piece of equipment for any woodshop. 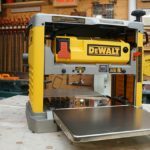 These planers are an excellent option for small home woodshops and contractors that need a portable option. While not big and powerful as full size shop thickness planers, benchtop thickness planers are still very capable of effectively planing a wide range of wood products. 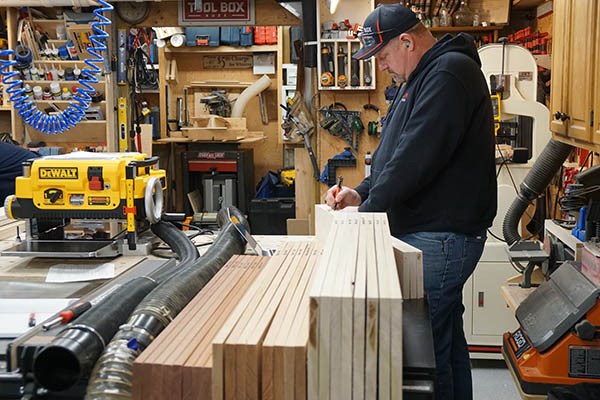 Thickness planers allow users to purchase a wider range of raw wood materials (often at cheaper prices) and mill the wood to the exact dimensions needed for a project. For this head-to-head test we focused on planing several different wood species, the surface finish, the power, and pricing. Below is a detailed discussion of our testing and evaluation. Portable thickness planers have to squeeze a lot of power into a small footprint that can be reasonably moved around a shop or to a job site. But even within this limitation there are some substantial differences in size and weight of the machines we’ve tested. But every machine is capable of planing boards 12 to 13 inches wide and 6 inches tall. The specifics and the differences are show in the lists below. 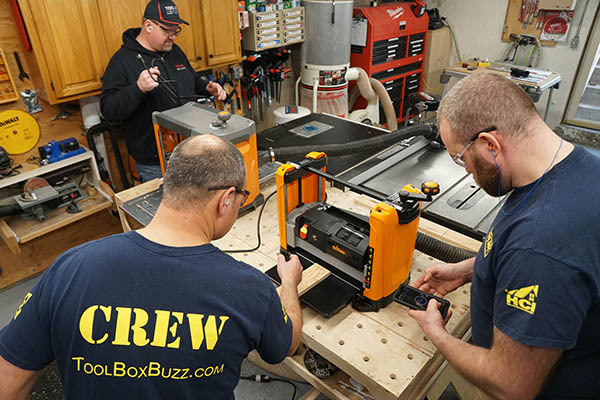 Pre-Test Inspection and Adjustment – We looked at how level the infeed and outfeed tables were, we adjusted them, and noted how easy or difficult the process was. 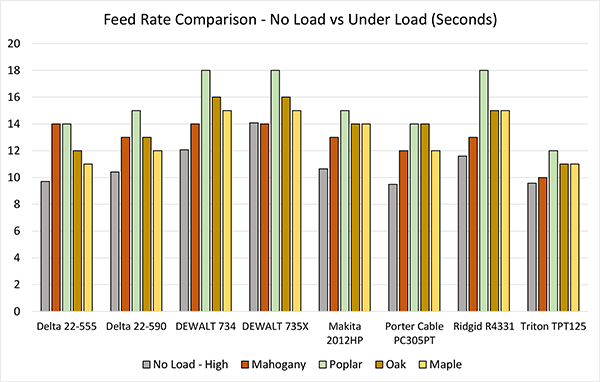 Feed Rate (Speed) – We measured the no-load feed rate of each planer and compared that to the feed rates under load for different material types. In our opinion this provides a sense of how powerful the motors are. Maximum Depth of Cut Performance – For this evaluation we measured the amp draw for each thickness planer under load planing several different types of wood. Again in our opinion this helps compare the strength of the motors during the planing process. 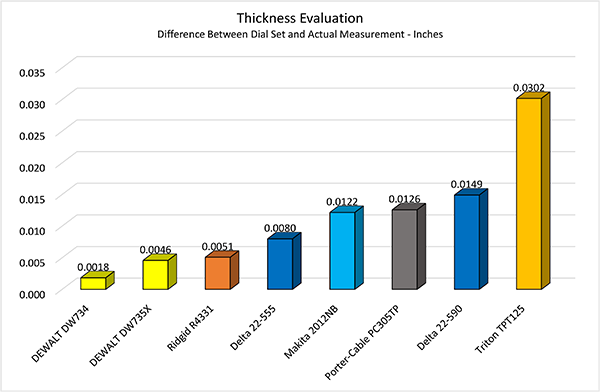 Depth of Cut Accuracy – For this evaluation we wanted to look at how accurately the planers remove a specified depth. Each planer has a dial that when turned a specified amount will theoretically remove a given depth in a single pass. We compared how accurately each planer was able to remove a fixed depth based on the dial. 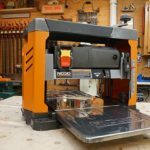 Snipe Evaluation – Snipe is fairly common with thickness planers, especially benchtop models like the ones in this evaluation. 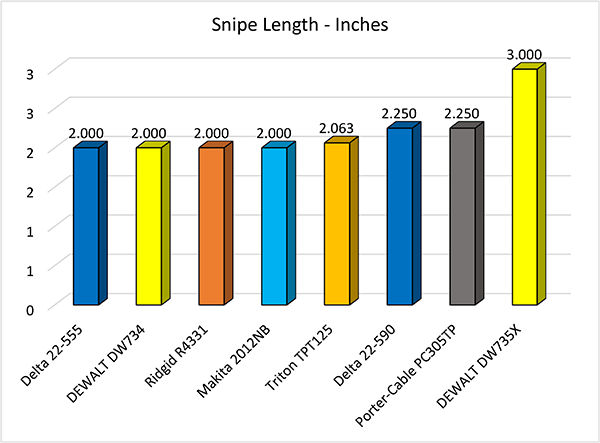 We compared the length of snipe for each planer and material type. Surface Finish Evaluation – Ultimately the surface finish is really important, especially if the finish reduces the time to prepare the work piece of paint, stain and or clear finishes. 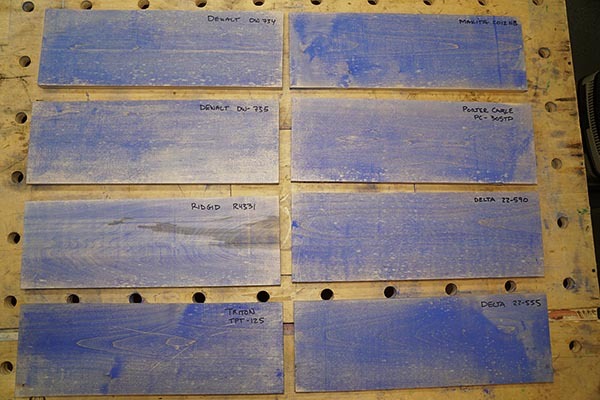 We applied blue chalk to the surface of the boards in order to improve our visual inspection combined with a physical inspection (feeling the surface) to rank the surface finish for each planer. 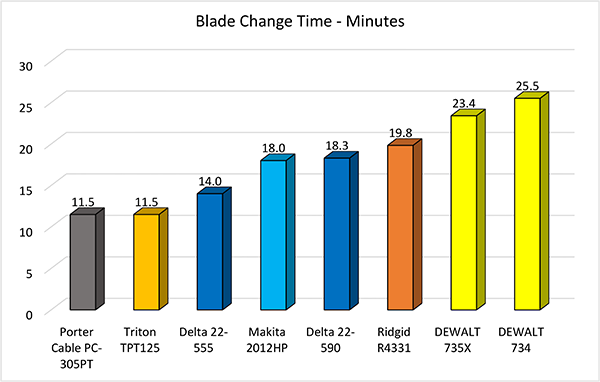 Blade Change Evaluation – Lastly we measured the time to do a blade change on these planers. Changing blades is a necessary task for any thickness planer so we wanted to see how they compared. Warranty Coverage – We summarized all the warranties. Pricing – We list the current pricing at the time of publication. 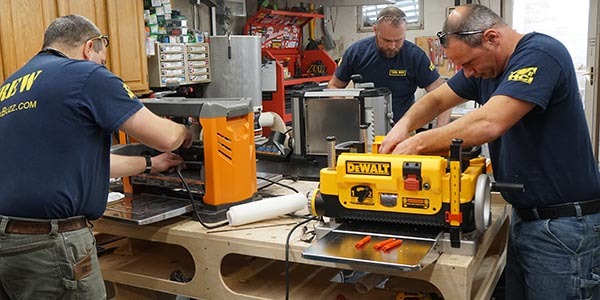 Prior to testing day, we unboxed the bench-top thickness planers and set up the equipment with dust collection manifolds (if so supplied) and put on accessories. In particular, we adjusted the in-feed and out-feed tables to ensure each were level with the planer bed. It’s extremely important that the in-feed and out-feed tables are level in order to have consistent and representative tests. The as-shipped accuracy of the tables varied between the different models.We adjusted the in-feed and out-feed tables separately and then checked for level across the entire machine. The worst measured vertical deviation from flat at the edge of the outfeed table nearly 1/8” above the surface of the planer. All of the machines except the DEWALT DW735X needed minor adjustments to reach a level surface. Most of the planers utilize a bolt to adjust the table vertically with a captured nut to hold the adjustment bolt in place. All of the units had a similar table adjustment but one. 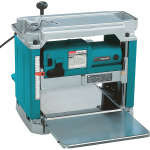 We were very impressed with the Makita planer and its setscrew adjustment. The Makita machine had, by far, the easiest adjustment method of all of the planers. The four setscrews were easy to reach and we found it easy to dial in the proper adjustments. We’re not going to rank this category as we feel a bench-top shop tool like this will always require some setup and fine tuning. Of the 8 planers Makita definitely has the best system for making those adjustments. While we didn’t rank dust collection it’s worth discussing briefly. 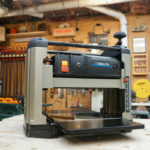 Thickness planers produce high volumes of wood chips and dust, probably more so than most any other tool in the woodshop. 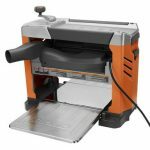 All of the planers (with the exception of one) comes with a dust shroud so the planers can be attached to a dust collector. 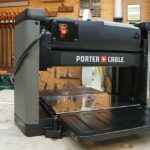 The Porter-Cable does not come with a shroud (a subscriber on our YouTube channel says one is available for the PC from Delta, Delta part number 50-359 , so maybe you can find one). So anyone that is interested in this model should plan on lots of clean up after planing. 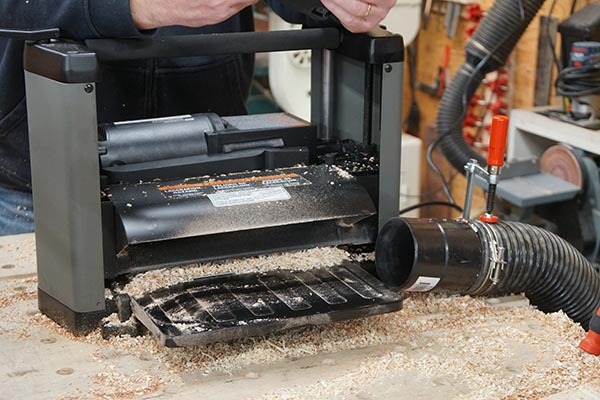 All of the other planers tested worked well when attached to the shop dust collection with little variation in performance among the different models. We recorded the no-load feed rates for each planer. To do this, we adjusted each planers depth until it contacted the wood but had not reached the depth where the cutter blades hit the wood. In order to record the no-load feed rate for a section of wood 45″ long (same length of the samples we’d be running through the planer), we used a longer board (60″) with two marks near each end that were 45″ apart. This allowed us to visually time the 45″ section as it passed by a reference point on the planer. For each planer, we ran this test three times and used the average of these times for a comparison between the no-load and fully loaded feed rates of each machine. The graphic above shows the no-load feed rate for each machine along with the feed rates of each machine for each sample of wood. We were looking to see which planers had enough power to sustain the no-load feed rates throughout the different boards that were planed. Above you can see a graphic showing the ratio of the no-load feed rate compared to the average loaded feed rate (average feed rate for the materials we planed). 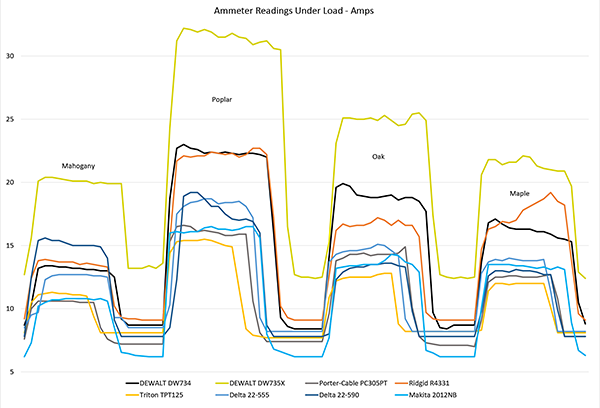 This just gives a good relative comparison of how the motors performed under load. 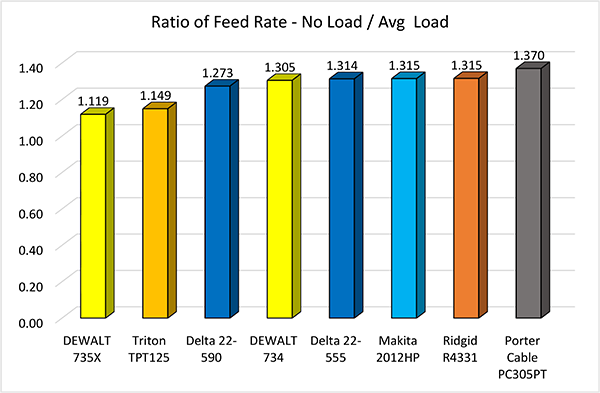 The DEWALT 735X and the Triton TPT125 were able to keep the feed rate much closer to the no-load rate compared to the rest of the field. We did rank this category as it’s a great way to evaluate the power of the planers. 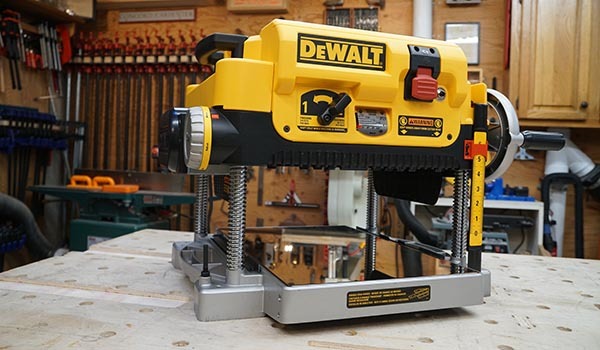 The top three included the DEWALT 735X, Triton TPT125 and the Delta 22-590. We wanted to know how each machine performed at maximum loads (which results from cutting at the maximum depth in a single pass that the manufacturer recommends). 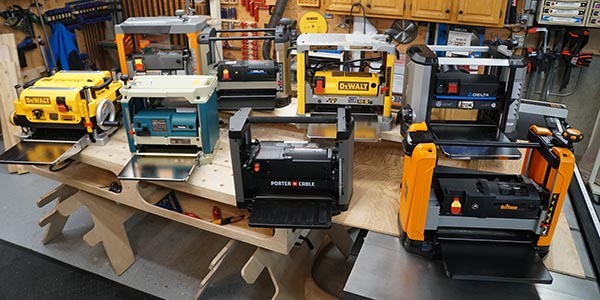 More specifically, we wanted to know which planer pulled more power (maximum amp draw) and which one had the best feed performance relative to its no-load condition. During this test, we set each planer to its maximum depth of cut (as recommended by the manufacturer) – usually 3/32 inch. We ran four species of wood through the planers and recorded the time for the cut and the amperage profile for each cut. Each wood sample for each machine was 45” in length. This was the same length of the no-load speed test. Our team set up a FLUKE 3001 FC recording ammeter that measured values on a one second interval and sent the data via wireless link to our computer for later analysis. The wood samples we used in this test were 1×4 Mahogany decking, 1 x 8 Poplar, 1×6 Oak and 1×6 Maple. We knew that the 1×8 Poplar at a maximum cut depth would tax the power of these planers. We also wanted to see how the different hardwoods would exercise the planer capacity. While we’re not ranking this category we do feel the data is interesting and informative. As you can see above the DEWALT DW735X pulls some serious amps under load. It points to the much more powerful motor in that unit. The power difference was clear during the planing operations as it didn’t seem to care what we ran through it. 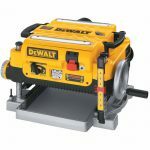 But it’s important to note if you’re going to buy the DEWALT DW735X you MUST have a dedicated 20A circuit as it’s not going to run well on a 15A circuit. 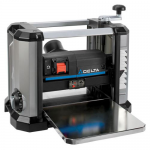 Bench-top thickness planers have a dial used to move the cutting heads up and down to set the depth of cut. On each model the dial indicates how far the heads move up and down per revolution of the dial. We used calipers to measure the average thickness of each wood sample before and after a pass to remove 3/32″. We then compared how accurately each planer was able to do that and listed the average deviation from the 3/32″. 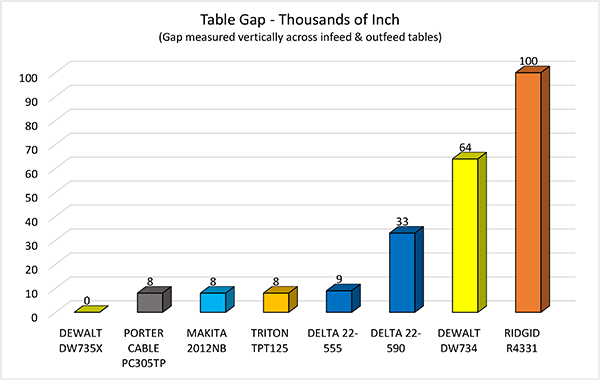 As you can see above, the DEWALT DW734 performed the best with an average deviation from 3/32″ of just under 2 one-thousandths of an inch. 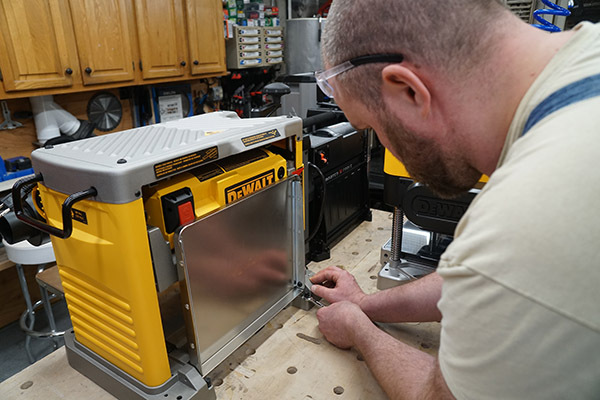 The DEWALT DW735X came in second with just over 4 one-thousandths of an inch followed by Ridgid R4331 at just over 5 one-thousandths of an inch. Last place was the Triton that averaged just over 3 hundredths of an inch deviation. We tested how much material would be ‘lost’ to snipe. We had already adjusted each planer’s tables to be flat, and level to the planer bed, prior to the snipe test. The TBB Crew selected the maple wood for the snipe test. We thought the lighter color and tight grain structure of maple might show the location and the depth of any snipes better than the other woods. For this test, we set all of the planers to a uniform depth of 3/32”. Each piece of wood was started at the first roller of the planer and we left our hands off the sample until it stopped past the outfeed roller. 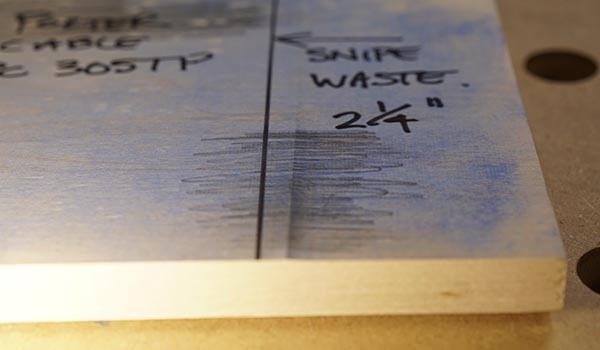 Next blue chalk powder was rubbed onto the last 6” of the board in order to make the snipe condition stand out visually. Finally we marked the ‘ridge’ of each snipe cut so that we could measure the amount of material that each planer produced for waste if the snipes were cut off to use the uniform thickness material. What’s interesting about this data is how well the snipe length correlates to the distance of the rollers inside the planers from the cutting heads. The length of snipe on all the models we tested nearly mimic this distance. The nice thing here is the snipe should be predictable for each model and allow users to plan accordingly. 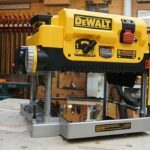 Users of the DEWALT DW735X will ultimately “waste” more material over the life of the planer. However, with all the planers having relatively the same amount of snipe we’re not ranking this category either but rather letting you see how they all compared. 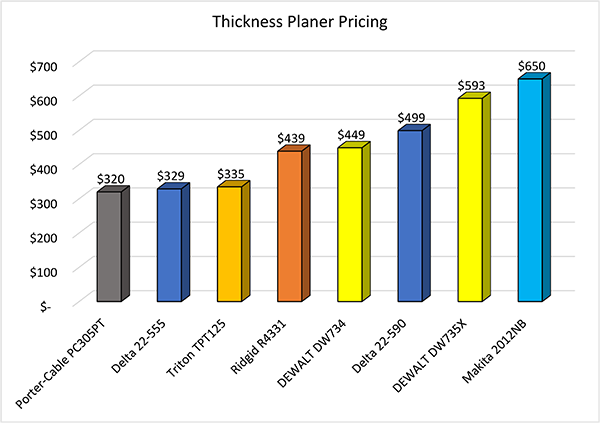 Another consideration when evaluating bench-top thickness planer performance is the surface finish. 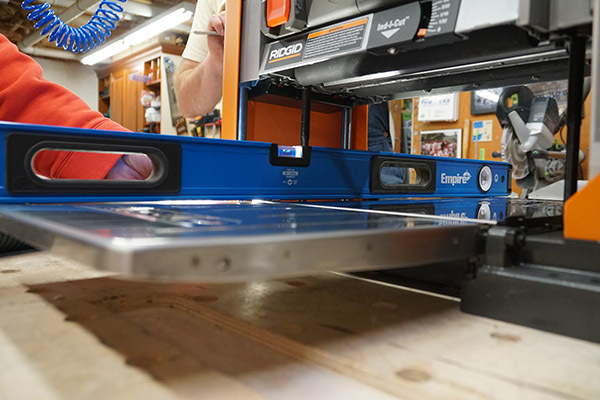 Bench-top thickness planers use a set of rotating blades to “shave” off the surface of the board being planed. 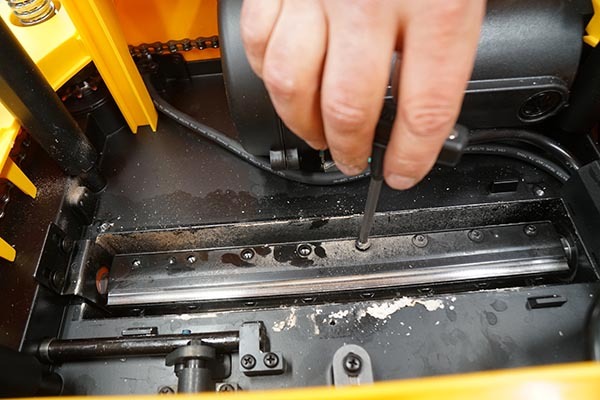 As a result of the rotational blade movement, “small bite size” chunks are removed as each blade contacts the surface, resulting in very slight ridges that can be left on the surface of the planed board (often referred to as milling marks). Planers can also tear out small chunks (scallops) from the surface. Between the milling marks and scallops the board could require more or less sanding to create a finished surface that will take paint, stain or clear finish well. 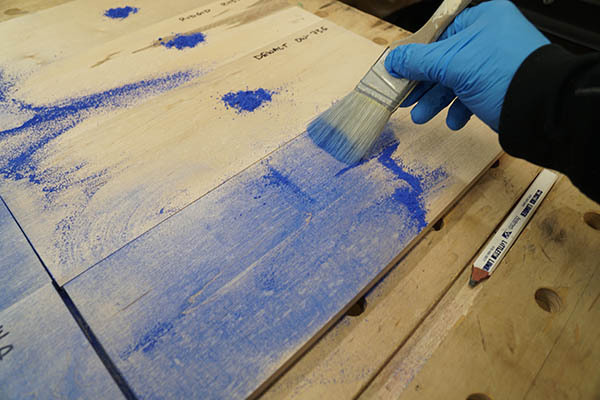 We applied blue chalk to the surface to highlight the milling marks, and scallops, for a visual inspection. We also evaluated the smoothness by simply feeling the surfaces. 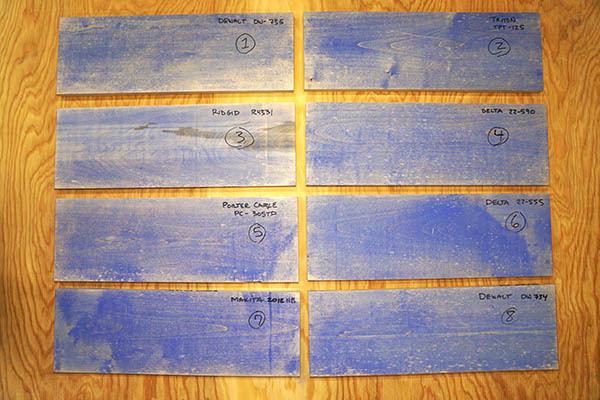 While very subjective, we ranked the planers based on the samples of Maple shown below. While all the planers produced a “smooth” finish to the touch, there was quite a variation of smoothness resulting from the milling marks and scallops. The DEWALT DW735X was by far the best finish of all the samples we planed. The amplitude of the milling marks was consistently smaller and there was very little “scalloping” of the surface compared to all the other planers. This is likely attributed to the powerful motor and excellent blades. In addition, th e735 has three blades in the cutter head. Coming in 2nd place was the Triton TPT125 followed by the Ridgid R4331 in third place. Both the Triton and Ridgid had similar results. Coming in 4th was the Delta 22-590 with minimal milling marks but noticeably more scalloping. Is it easy or difficult to change out the blades on any given machine? Our crew took each machine and armed with the instructions and the tools in our workshop changed out each blade on each machine. Obviously, the planers with three blades would take more time than the machines with two blades. But is this process easier on some machines that others? As you can see above the times required to change the blades on the planers varied from just over 11 minutes to just over 25 minutes. The reality is a user might change blades once or twice a year (twice would be heavy use) so the difference from 11 to 25 doesn’t seem enough to warrant why you might buy one over another model. Therefore we’re not going to rank this category, simply share the data so you can see that blade changes are not overly complicated. Warranties are really important to some users, and many of you have asked us to include them in our reviews. 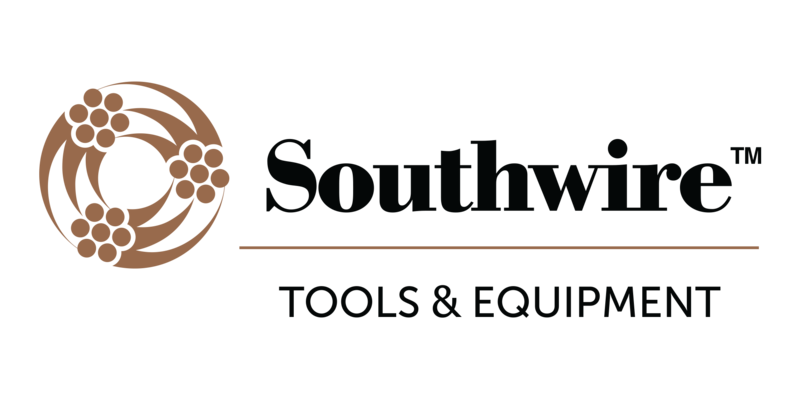 Below is a list of the warranties applicable to the planers we tested. While ranking the warranties might seem simple, we’ve decided to just list them rather than rank them. Ultimately, warranties can be a tough issue, and how easily you can get warranty service is likely to be as important as how many years the coverage is. We’ll let you make your own determination on which warranty appeals to you. 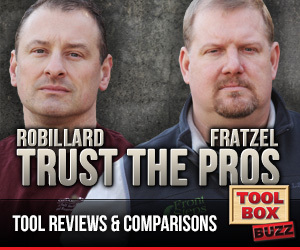 Price is often a huge part of the equation when determining what tool is best for you. There’s a huge difference in pricing in this test from the low $300 range up over $600. We are ranking these straight on the lowest to highest with prices available at the time of publication. We realize there is a “value” proposition that many will look at, but that will factor into our overall ranking when price and the other categories are combined. 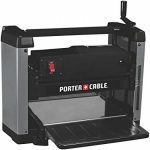 Finishing with the best price is the Porter-Cable PC305PT at $320 and rounding up the most expensive is the Makita 2012NB at $650. 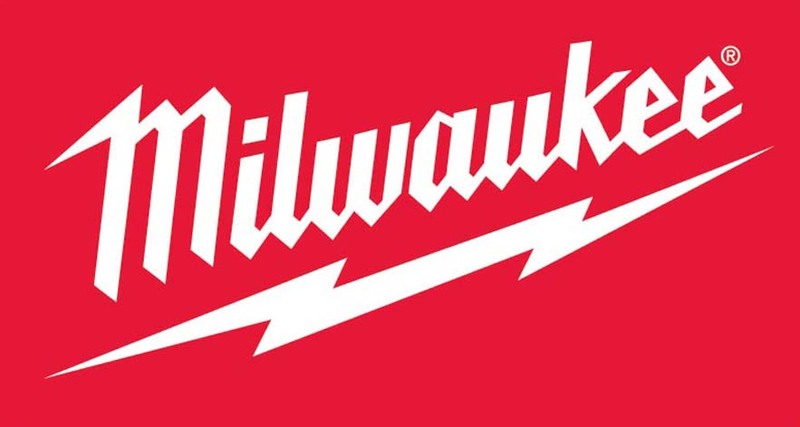 Here we are again trying to rank the tools in our Head-to-Head and give you a winner. The more of these we do, the more we learn, and in this evaluation we’ve taken a slightly different approach. Some of the categories that we set out to evaluate we decided not to include in the final ranking. However, we did provide information from that category as we feel it’s valuable to some readers. Also, the more we do these the more some folks comment about how they would weigh different categories differently. That’s all great feedback, ultimately we need to come up with a winner (our winner) but each of you can take the data we’ve presented and weigh the results differently to best match your needs and come up with your own winner. Below is a table showing how each of the 8 planers stacked up in the 4 categories that we counted in our final evaluation. 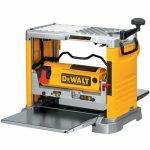 Finishing in first place by a large margin was the DEWALT DW735X. 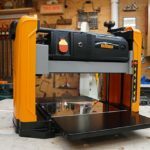 This wasn’t a surprise to us as several of us have used this planer for quite some time and it’s really the best benchtop thickness planer on the market without a doubt. What did surprise us was the 2nd and 3rd place finishes of the Triton TPT125 and the Ridgid R4331. If you’re looking for a good performing affordable planer the Triton is certainly worth noting. 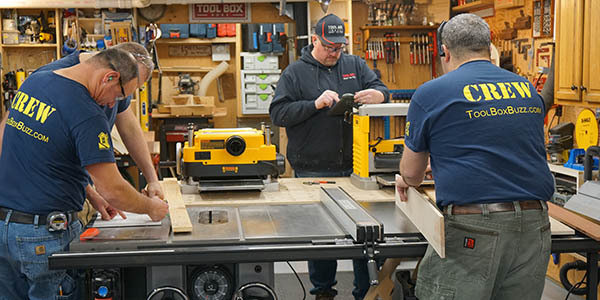 Ridgid has a nice line of woodshop tools that go unnoticed often and it was nice to see them perform so well in this category. 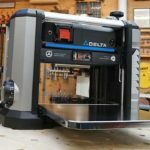 While the Delta 22-590 finished near the end in this evaluation, the team felt it was also a nice planer to consider. 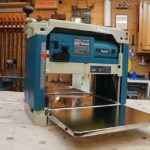 The Makita is a very well-built planer with some nice features but the price wasn’t as competitive and the surface finish, at least on the materials we tested, wasn’t nearly as good as some of the other models. 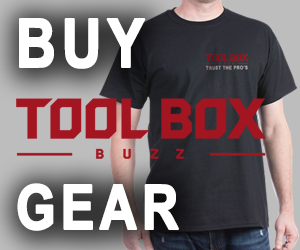 Todd Fratzel is the Editor of Tool Box Buzz and the President of Front Steps Media, LLC, a web based media company focused on the Home Improvement and Construction Industry.He is also the Principal Engineer for United Construction Corp., located in Newport, NH. In his capacity at United he oversees the Residential and Commercial Building Division along with all Design-Build projects.He is also the editor of Home Construction & Improvement. Ihave a problem with my DeWalt 735. When the temperature is below 70 degrees and is getting colder the boards will not feede into the planner. It is like the feed rollers become to stiff. Suggestions – Please.. When was the last time you cleaned them? They really need to be cleaned off occasionally, I use mineral spirits. I watched this video on YouTube. A lot of good information, succinctly presented. The movement between the speaker and showing the actual testing made for an interesting video. Now I know better which tool to wish for!